Made of Premium Goatskin Leather. Reinforcement Palm in Goatskin with Foam Padded. Hook and Loop Fastener for comfortable fitting and flexible movement of hand. Available in Adults and Childern Sizes XXS - XXXL. Customize Logo and Custom Designs are being offered for Weight Lifting Gloves. Hook and Loop Closure Strap with your choice of logo on Weight Lifting Gloves. Weight Lifting Gloves produced in Good Quality of Material with best prices. Back Stretchable Fabrics which gives a superb comfort fit and enhance grip and snug fit. 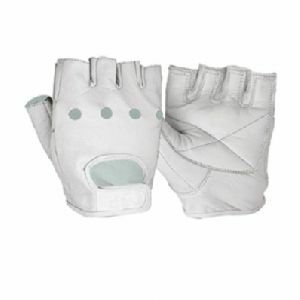 Weight Lifting Gloves are avaliable in different colours as per customer's requirements. Back Stretchable Fabrics / Lycra are available with any kind of sublimation printing as per custom design. Synthetic Leather Palm Available with Silicon Printed for more grip, as per custom design of Weight Lifting Gloves. Artifical Leather Scerno, Synthetic Leather (Amara), Cowhide Leather, Goat Leather, etc.